A slate roof isn’t just a roof for those who love it – it is American history, architectural beauty, a work of art. It tells a story of the land it came from, and the men who labored and handcrafted the rock into tiles. Historical slate roofing still adorns many federal buildings and national landmarks such as the Smithsonian Institute and the boyhood home of Thomas Jefferson. A barn was the first building to have a slate roof in the Slate Valley in 1848. The barn is still standing today, roof intact. Today, there is a resurgence in this traditional roofing, as its durability and aesthetic is unmatched. Slate is a natural stone that originates from clay and silt deposited on ancient sea beds. Over time, intense heat and pressure transformed the clay into new minerals such as mica, chlorite and quartz. Slate varies in composition, color and quality depending on its chemical makeup. 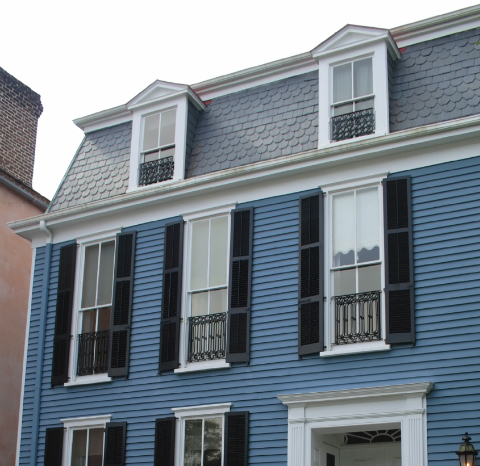 For example, slate roofing originating from Maine and Virginia is deep blue-black in color. Green, red, purple and mottled slate is found in Vermont. One of the world’s only commercial sources of red slate can be found in the region around Granville, New York. Slate roofing is one of the most durable roofing materials available today. A properly installed slate roof can easily last for 100 years, requiring little maintenance. On the other hand, an improperly installed slate roof can begin to show serious problems in the first five. Most of these problems are entirely preventable. Maintenance of your slate roof should be done by a qualified slate roofer. An annual inspection is prudent, as repairing small defects such as broken tiles or loose fastenings will ensure a long lasting roof. Left untreated, water can damage interior finishes, deteriorate the roof sheathing and possibly degrade the structural integrity of your roof as a whole. Two major signs of a full roof replacement are powdering on the underside and major delamination or flaking. Try the “knuckle test”: tap the slate at several different places. It should emit a clear, solid sound. If you hear a dull thud, roof replacement is in order. Whatever you do, never, ever walk on your slate roof. A slate roof is expensive to install or repair. If you are going to invest in a slate roof, make sure to do your research. Slate is a natural material, and so there are varying degrees of color and quality, even if extracted from the same hole in the ground. The quality of the manufacturing is also very important. Slate tiles should be treated individually, with great care for the process. When choosing a contractor, it is best to go with someone who has a lot of experience with installing slate roofing. It is a whole different beast from installing other types of roofing, with specialty tools and processes. Take time with your research, as ending up with poor quality slate or an inexperienced installer will cost you a lot of time and money.